We at StoreYourBoard.com know you'll love our products! We stand behind them with a 90 Day Money Back Guarantee. If for any reason you're not satisfied with your purchase, return it and we'll refund the purchase price of the items(s). Return shipping charges and restocking fees may apply. If you're not satisfied with your order, return it within 90 days for a refund of the purchase price, minus any fees. 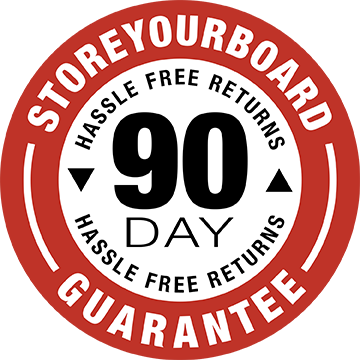 To setup your return, email info@StoreYourBoard.com. Please include your order number and indicate what item(s) you want to return and why. We can provide you with a return shipping label for a flat-rate price (to be deducted from your refund), or you can return the item at your cost. Once we receive your item/s and confirm they meet the Conditions for Return, we'll credit your return to your original payment method. Shipping costs paid by you are non-refundable. Products must be in original, unused and unassembled condition, and in original packaging complete with tags, instructions, and inserts. In the unlikely event that your item/s arrives in damaged condition, contact us at info@StoreYourBoard.com. We'll send you a replacement ASAP. On standard size items we do not charge restocking fees. Oversize items are subject to a 20% restocking fee. Orders are shipped as soon as possible in accordance with the item's availability as noted on its product page; some products take longer to process for shipping than others. If you order multiple items, the availability for each of those items may vary, and your items may be processed and shipped separately, and may arrive at different times. For products with "Same Day Shipping" availability, orders placed by 3pm ET will be processed for shipping that day, subject to exceptions. Your order's arrival date depends on when the item ships ("item availability") and the method of shipping you select at checkout. In calculating estimated order arrival, consider only business days (Saturday, Sunday, or holidays are not shipping days). We unfortunately cannot guarantee our carriers' performance against unexpected delays, especially during the busy holiday shipping season. The most common and cost-effective shipping option is Standard Shipping. The cost of Standard Shipping is determined by total purchase price, as shown in the table below. When you choose Standard Shipping, your order will be shipped with FedEx, UPS, or USPS. Can I choose Expedited Shipping? Yes, we offer expedited FedEx services at checkout: FedEx Ground, FedEx Next Day, FedEx 2 Day, and FedEx 3 Day. If you select expedited FedEx shipping, we reserve the right to apply additional oversized shipping fees due to dimensional weight restrictions and carrier surcharges, and to ship via another carrier/method if we can deliver your order in the same timeframe. We have a curated collection of many (but not all) products available for international shipment at world.storeyourboard.com. Some items can ship to P.O. Boxes but those orders require pre-approval; email info@StoreYourBoard.com with your requested order.